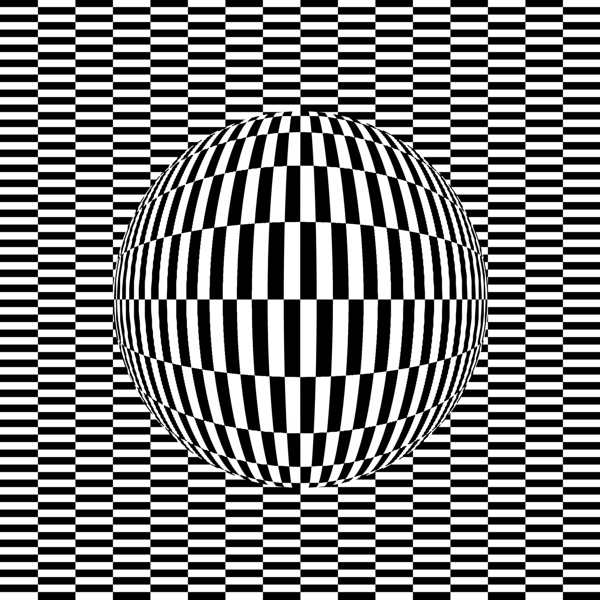 As you look at this black and white figure, move your head back and forth. 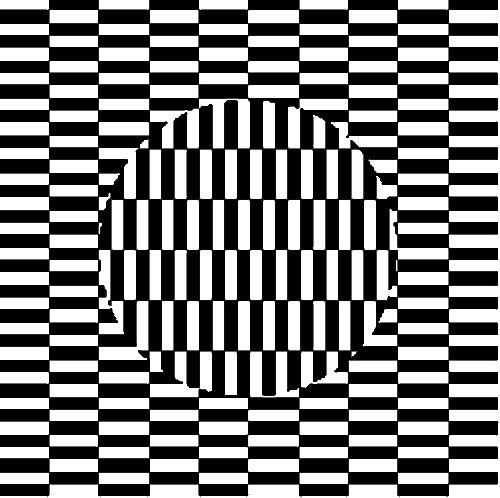 You may notice that the circle seems to shift independently from the background. The apparent drifting or jumping in the design mirrors your eye movements and head movements as you peruse it. Scientists propose that: "Slow sliding movements may represent involuntary ocular drifts, while occasional jerks suggest a contribution by microsaccades." 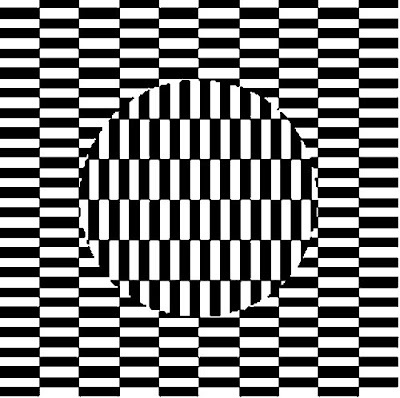 Here's another variation of the illusion. To get the full effect, try picking up your computer or device and gently shake the display left and right. 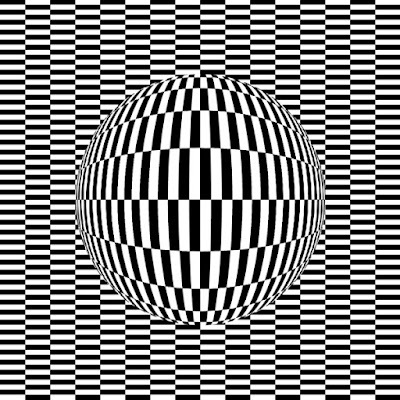 The sphere or disc in the center separates from the plane of the background and becomes dimensional. In this variation, the central circle and the ring around seem to shift and shimmer in relation to the background. Researchers have noticed that these effects diminishes with age. There's some debate about whether that fall-off is due to weaker eye movements or less robust perceptual abilities within the brain itself. 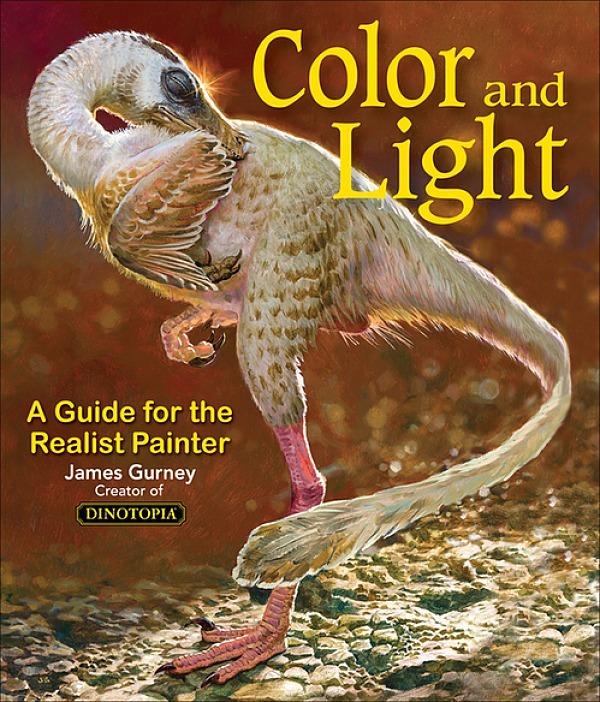 I'm wondering how I could this in a realist painting to add movement. It'd be interesting to test how the effect falls off with reduced contrast, less regular shapes, etc. "...weaker eye movements or less robust perceptual abilities within the brain..."
Hmmm...neither sounds desirable. You mean it's not due to having the age-acquired wisdom to see through illusion? Interesting! I am 67 and I can barely see any movement at all in these illustrations. I have noticed that when I watch some repetitive circular motion, such as whisking something on the stove, and then look away that the background keeps circling for a couple seconds. That might be a completely different phenomenon though. I'm going to show this to my 30 something daughter later today and see how prominent it is for her. Ernest, I'm pretty sure the illusions rely on very precise alignment of very precise shapes, but I think you could do some pretty interesting experiments with value and hue changes using some graphic design software. 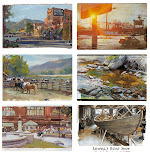 "I'm wondering how I could this in a realist painting to add movement"
It would be a hard thing to do without seeming like a 'trick' though. Norman Rockwell did something intersting with his 'art student' painting - the pallet the student holds had an actual 3d wad of paint on it, just like you would put onto a real pallet. Those are fun. The last one gave me vertigo. I rather enjoy a little vertigo now and again. I *REALLY* dislike the effect. Asking myself why, I realized that they look similar to the migraine auras I get. That thought is interesting, leading me to even more questions. EB Snook and Patricia, yes, some of the websites that had these illusions posted warnings that they might lead to nausea or vertigo. Roberto, thanks for those links. My Pen and Ernest, it makes sense that someone might want to use these illusions in a painting. After all, Spillman got the idea from a Japanese artist named Ouchi in the first place. Steve, I've heard that there are such things as visual calisthenics to strengthen eye muscles, but I don't know how well that works. I'm 62 and did not notice much just by shifting my head back and forth, but when I used the touch screen to move the images, I could see the illusion.